The U.P. Institute for Small-Scale Industries (UP ISSI), with support from the Small Enterprises Research and Development Foundation (SERDEF), took a historic first step into digital-learning technology by launching Saturday the beta run of the e-version of its long-running Start Your Own Business (SYOB) program. 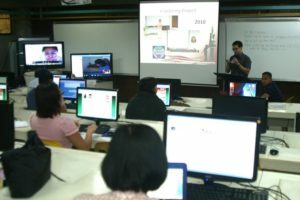 Fifteen entrepreneurs and aspiring entrepreneurs gathered at the Computer Laboratory of the UP ISSI in Diliman, Quezon City to attend the course opening and walk-through – the first of only two requisite face-to-face sessions in the e-learning program. The number includes two OFWS — one based in Dubai and the other based in Singapore but on vacation in Bukidnon — who took part in the session on real time via Skype connection. The beta test ot eSYOB will run for eight weeks, until May 26 when the e-learners will present their business plans to a panel of evaluators in the second and last of the requisite face-to-face session. According to ISSI Knowledge Management and Information Communication Technology (KM-ICT) Chair Ian Jester de Vera, eSYOB began as a hybrid online program in 2009. When the KM-ICT unit was put up a year later, it pursued the development of a full-blown e-learning course. It took more than a year for the e-infrastructure to be laid in place and for the digital self- administering modules to be completed. He said that the initiative manifests the commitment of the UP ISSI to live up to its pioneering role in small enterprise and entrepreneurship development in the country and in pushing the “Sulong, galing Pinoypreneur” slogan the Institute has adopted. In her speech, Prof. Luvy Lizette Gervacio of the UP Open University, who served as consultant to ISSI in developing the e-course, congratulated the ISSI team for a job well done in developing the program and the first batch of learners “who took a chance in taking the program” being beta-tested. 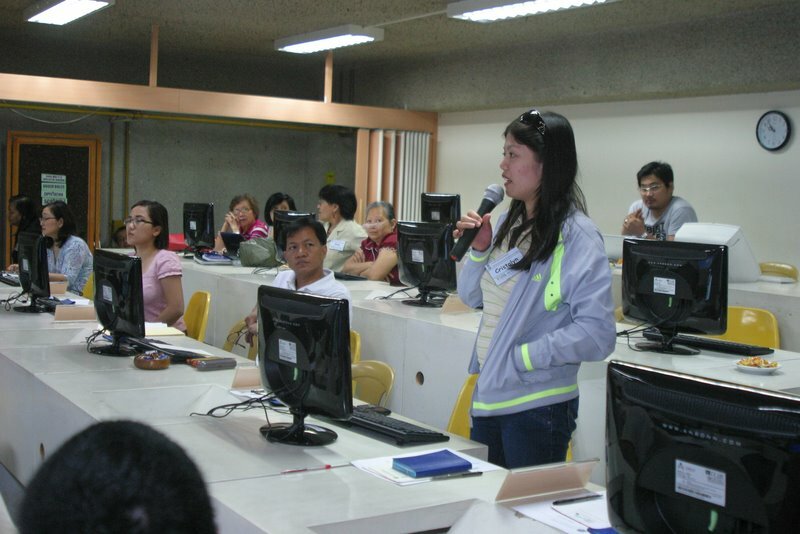 Prof. Gervacio explained the rationale for e-training programs. “It is about thinking of the needs of the learners … it is about keeping up with the changing times.” She added it is a way to pursue continuing learning which is life-long. Dolly Recio, eSYOB program manager introduced the tutors namely herself, Ditas Esguerra, and De Vera. She also asked the learners to say something about themselves. As it turned out, four of the learners are already in business while the rest are pursuing their professions (teaching, research, art), working with government, working overseas, or studying. Three of the learners were chosen at random and interviewed as to their motivations for taking the course. Joel Autencio, 33, worked for 10 years at Allied Bank as credit appraiser. When he wearied of the 8-5 routine and realized the employee career path was quite narrow, he quit to put up Sitepoint Realty (RealtyB12.Ph) in July 2011. In less than a year, the one-man business has begun to take off and was able to establish tie-ups with developers. “I enrolled in e-SYOB to help me prepare a business plan for my venture I know I will be planning my business after the fact.” Better late than never, he surmised. Besides, planning would help him shape what his start-up business would be in the short and long-term as well as formulate strategies to use to attain his business goals. An e-course was perfect for him, he said, because he could maximize his time. He is usually at his sharpest in the early hours of morning and this is the time of day he plans to study the eSYOB modules, he added. Joi Mamaril, a SPED teacher by training, still holds a job at the UP ISSI but looks forward to the day she finishes her MS degree to put up her own Special Education Center. To prepare for that time, she volunteered to participate in the test-run the the eSYOB. She liked the fact that it was self-paced and she would be able to read lessons almost anywhere. A scuba diving enthusiast, she reckoned she could take the e-lessons with her even in some remote island between dives. Realizing interaction with tutors and fellow-learners would be less tangible, she nevertheless would try to make maximum use of online communication, she said. For her part, Jojie Flores, an officer of the Small Business Corporation, where she has worked for many years, took the course in preparation for retirement. Like most of her co-learners she welcomed the convenience of a flexible training schedule.